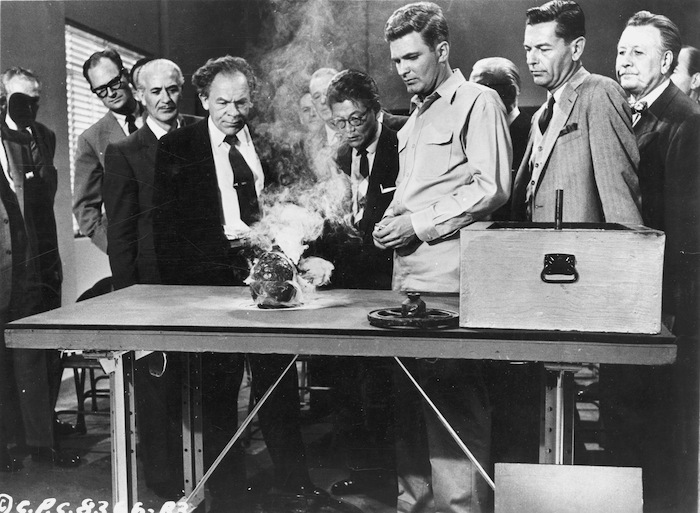 DVD Review: The Night The World Exploded (1957). Mill Creek Entertainment’s arrangement with Columbia has resulted in some terrific DVD sets, many in the horror/sci-fi neighborhood — and at a great price point. One of the recent ones is the oddly-named, but wonderful, Vintage Sci-fi Six-Movie Collection. The Night The World Exploded (1957) is some great Sam Katzman sci-fi nonsense (that takes places almost entirely in the daytime). The newly-discovered Element 112 is expanding and exploding in the underground pockets created by drilling, mining and other earth-mangling activities — threatening to knock the earth off its axis or blow the whole thing to bits. It’s up to a team of earthquake-predicting scientists to sort things out before it’s too late. One of the advantages of possessing absolutely no scientific knowledge is the pseudo-scientific babble that propels movies like The Night The World Exploded plays well. And there’s a lot of it in this one, delivered by a capable cast. There’s also the assured direction of Fred F. Sears and Benjamin Kline’s great cinematography (with some shooting at the Iverson Ranch). Thanks to Kline, these Katzman pictures look better than they deserve to. The Night The World Exploded played with another Katzman-Sears picture, The Giant Claw. It’s a decent giant monster movie spoiled by maybe the worst-looking movie monster in cinema history. 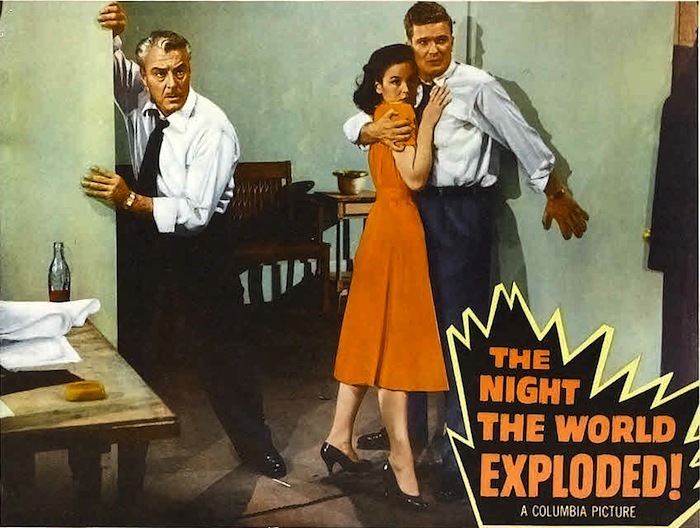 The Night The World Exploded looks terrific in this set from Mill Creek Entertainment. Columbia supplied them with a clean, crisp 1.85 transfer — the other five films in the collection look just as good. I didn’t see any bit rate problems from squeezing six movies onto two discs. Vintage Sci-fi Six-Movie Collection comes recommended. were the two Toho’s from Sony’s previous Toho set. BTW “TEENAGER’S” monster was just the shadow of a lobster!!! You’re right, John. Teenagers does have a crappy monster. What bothers me about The Giant Claw is that an otherwise respectable monster movie is completely trashed by the monster. I am really impressed by Columbia’s transfers of these films. The contrast level on the B&W ones is right where I like it. going to up-grade all their second string classic monster hits. and they are beautiful! No “forced Subtitles” either. USA and giving us the stuff we all crave. produce a de-luxe box set at a fraction of the price. Being mega impatient can be costly sometimes. added to the mix. All will be revealed soon I’m sure!